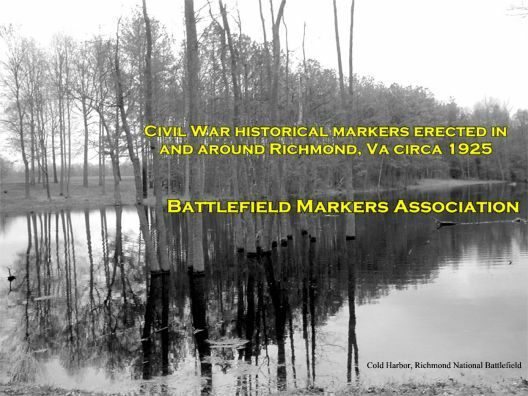 In the early 1900s, the Battlefield Markers Association identified key civil war sites in the Richmond area and erected these unique historical markers. Designed to be read from an automobile, the markers consist of a cast iron inscription tablet set at an angle atop a large concrete capstone resting on a granite base. Douglas Southall Freeman wrote the inscriptions, hence the name "Freeman Markers". The success of the Richmond group inspired others in the state to organize. In 1925, the Battlefield Markers Association (Western Division) was formed. They erected 25 markers from Bull Run to Appomattox and throughout the Shenandoah Valley. Though technically not Freeman Markers, they are similar in design with slightly larger heavy bronze tablets atop white granite block bases.